On December 22, President Barack Obama named Howard A. Schmidt, W7HAS, as the new White House Cybersecurity Coordinator. According to the White House, Schmidt -- an ARRL member -- is one of the world's leading authorities on computer security, with some 40 years of experience in government, business and law enforcement and "will have regular access to the President and serve as a key member of his National Security Staff. He will also work closely with his economic team to ensure that our cybersecurity efforts keep the Nation secure and prosperous." In an exclusive interview with the ARRL, Schmidt said that he credits Amateur Radio with getting him involved with technology: "In high school, one of my friends was a ham and he got me interested in shortwave radio, which in turn got me into building shortwave radios and equipment, many from Heathkit. As I got older, I took courses from NRI and Bell and Howell in electronics and built a number of projects, preparing me for my first ham radio ticket. I love technology, and it was Amateur Radio that caused me to build my first computer -- a Sinclair ZX-80 to use for EME calculations. I studied all about the OSCAR systems and would build equipment to monitor when they would pass within range of Arizona. Building these computers to support my ham radio hobby gave me the technical skills that I needed to start doing computer crime investigations and work on the early stages of computer forensics, in turn enabling me to start working on cybersecurity issues." Read more here. In 2009, the FCC issued more than 30,000 new Amateur Radio licences -- an almost 3 percent increase in the number of new licenses issued in 2008. At the end of 2009, there were 17,084 Novices, 334,245 Technicians, 150,970 Generals, 60,795 Advanced and 119,403 Amateur Extra class licensees. This past year was a banner year for new Amateur Radio licensees. According to ARRL VEC Manager Maria Somma, AB1FM, the FCC issued more than 30,000 new ham radio licenses. "In 2009, the demand for Amateur Radio exam sessions remained elevated and is still running at a higher rate than before the FCC's restructuring of the license requirements in 2007," Somma said. "This high level of exam session activity has produced an elevated influx of new applications, far outpacing recent years." A total of 30,144 new licenses were granted in 2009 -- an increase of almost 7.5 percent from 2008. In 2005, 16,368 new hams joined Amateur Radio's ranks; just five years later, that number had increased by almost 14,000 -- a whopping 84 percent! Read more here. On Wednesday, December 23, the Department of Defense (DoD) issued an Instruction concerning MARS, effective immediately. This Instruction gives the three MARS services -- Army, Air Force and Navy/Marine Corps -- a new focus on homeland security and a new name: Military Auxiliary Radio System. The Instruction is the first major revision to MARS since January 26, 1988 -- as such, the first revision since the 9/11 attacks and Hurricane Katrina, two major events that changed the way Amateur Radio dealt with emergency communications. In the past, MARS had focused primarily on emergency communications and health and welfare support. The DoD's Instruction now directs the three MARS services to provide "contingency radio communications" to support US government operations, DoD components and "civil authorities at all levels," providing for national security and emergency preparedness events. MARS units will still continue to provide health and welfare communications support "to military members, civilian employees and contractors of DoD Components, and civil agency employees and contractors, when in remote or isolated areas, in contingencies or whenever appropriate." MARS must also be capable of operation in "radio only" modes -- without landlines or the Internet -- and sustainable on emergency power (when public utility power has failed); some MARS stations must be transportable for timely deployment. Read more here. The February issue of QST is jam-packed with all sorts of news and information that today's Amateur Radio operator needs. From product reviews to experiments, from public service to on-the-air activities, the upcoming issue of QST has something for just about everyone. You'll find a plethora of technical and general interest articles, as well as monthly columns such as How's DX, Hamspeak, Vintage Radio and more. Click here to discover what's in store for you in the February issue of QST, the official journal of the ARRL. The completed tool aids in inserting or removing BNC jacks from a chassis without damaging the connector. Scott McCann, W3MEO, of Queenstown, Maryland, made this tool by soldering a BNC connector to the shaft of an old screwdriver (see photo): "I cut off the blade and tinned the shaft with ordinary solder and flux. I then removed the center pin and Teflon from a BNC plug and soldered the plug onto the screwdriver shaft. While it was hot, I 'locked up' the nut and collar with solder. Now I have a BNC driver, very handy for installing and removing BNC jacks without marring them, which can happen using pliers or other 'make do' tools." Do you have an idea or a simple project that has improved your operating? Maybe you've taken something commonly found around the home and developed a ham radio use for it? Why not share your hints with fellow hams in "Hints and Kinks," a monthly column in QST. If we publish your hint in QST, you will receive $20. Send your hints via e-mail or to ARRL Headquarters, Attn: "Hints and Kinks," 225 Main Street, Newington, CT 06111. Please include your name, call sign, complete mailing address, daytime telephone number and e-mail address. This feature -- including convenient Web links to useful information -- is a concise monthly update of some of the things ARRL is doing on behalf of its members, such as speaking with representatives of the FCC's five Commissioners concerning BPL, representing Amateur Radio at various meetings leading up to WRC-12, rolling out new platforms for the ARRL's Tech Q&A, processing certificates and endorsements for the Hiram Percy Maxim 140th Birthday Celebration and more. This installment covers the month of December. Read more here. This past weekend when I was working the ARRL RTTY Round-Up, I came across a call sign that I had never seen before. But that's not what confused me (as I become more active on the air, I run across all sorts of interesting call signs, such as 3V8ST). No, what confused me was that the supercheck database and my logging program told me that the call sign was located in the US. We all know that AA-AL, K, N and W are all US prefixes. Then why was 4U1WB showing up as being located in the US, too? I'm looking forward to getting one of these in my mailbox soon! 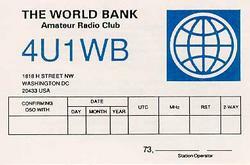 Upon assurances I was not going crazy -- and more importantly that the supercheck database and my logger were not broken -- I found out that 4U1WB is a United Nations call sign assigned to the World Bank Amateur Radio Club at the World Bank in Washington, DC. There are four 4U1 call signs around the globe: 4U1WB; 4U1UN, assigned to the United Nations; 4U1ITU, assigned to the International Amateur Radio Club at the International Telecommunication Union, and 4U1VIC, assigned to the Vienna International Radio Club at the Vienna International Centre. In the past, the United Nations has issued 4U call signs to various entities, allowing its use in areas where the UN has had peacekeeping forces. In 1995, an operation from Western Sahara used 4U/KC0PA, while Burundi used 4U9U in 1994. 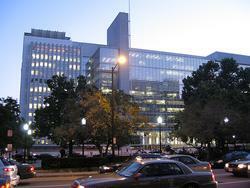 World Bank headquarters in Washington, DC. While 4U1UN and 4U1ITU count for credit toward the ARRL's DXCC award, 4U1WB and 4U1VIC do not. The DXCC rules define 4U1WB and 4U1VIC as "ineligible areas." These areas are classified as "extraterritorial legal entit[ies] of any nature, including, but not limited to, embassies, consulates, monuments, offices of the United Nations agencies or related organizations, other inter-governmental organizations or diplomatic missions." This rule also clarifies that these two stations are considered part of their "host entity" for DXCC purposes. This makes 4U1WB part of the US and 4U1VIC part of Austria for DXCC purposes. 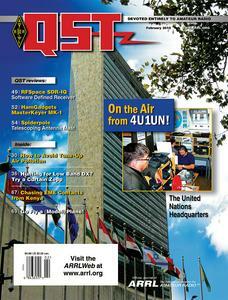 For more on 4U1UN, be sure to check out the February issue of QST. So now when you see or hear a call sign come across the ether to your radio with a 4U1 prefix, don't be alarmed when you find out that the call sign is based in the United States. Now you know! 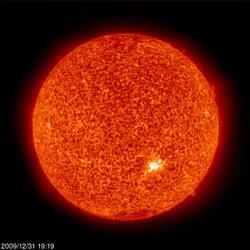 The Sun, as seen on Thursday, January 7, 2010 from NASA's SOHO Extreme Ultraviolet Imaging Telescope. This image was taken at 304 Angstrom; the bright material is at 60,000 to 80,000 degrees Kelvin. Tad "I yet have visions for the night" Cook, K7RA, reports: Looking at sunspot numbers for the past few years, we can identify three bottoms by using our 3 month moving average -- October 2007 at 3, August 2008 at 1.1 and 1.5 in March 2009. Between each of these months, sunspot numbers rose and declined. Now the 3-month average centered on November 2009 is 10.163, the highest since August 2007's average at 10.17. Currently, the Sun is blank; this is one of only two days without sunspots since December 9, but look for more sunspot activity soon. Look for more information in the Solar Update, available on the ARRL Web site on Friday, January 8. For more information concerning radio propagation, visit the ARRL Technical Information Service Propagation page. This week's "Tad Cookism" brought to you by John Keats' Ode on Indolence. The Question Pool Committee (QPC) of the National Conference of Volunteer Examiner Coordinators (NCVEC) released the new Technician class (Element 2) question pool on Monday, January 4. This new question pool will become effective for all examinations administered on or after July 1, 2010; it will remain valid until June 30, 2014. The current Technician question pool that became effective July 1, 2006 will expire June 30, 2010. The new Technician pool contains approximately 400 questions, from which 35 are selected for an Element 2 examination; it will contain graphics and diagrams, something new for this element. The current General class question pool was effective July 1, 2007 and is valid through June 30, 2011. The current Amateur Extra class pool was effective July 1, 2008 and is valid until June 30, 2012. Click here to watch ARRL Test Engineer Bob Allison, WB1GCM, present a preview of two Product Review items in the February 2010 issue of QST. This week, there is a running of the NCCC Sprint on January 8. The Mongolian RTTY DX Contest and the Midwinter Contest (CW) are January 9. The Hunting Lions in the Air Contest, the Michigan QRP January CW Contest, the WW PMC Contest and the North American QSO Party (CW) are January 9-10. The SKCC Weekend Sprint and the Midwinter Contest (Phone) are both on January 10. Next week, there is another running of the NCCC Sprint on January 15. The Hungarian DX Contest and the North American QSO Party (SSB) are January 16-17. The Feld Hell Sprint is January 17, the Run for the Bacon QRP Contest is January 18 and the NAQCC Straight Key/Bug Sprint is January 21. All dates, unless otherwise stated, are UTC. See the ARRL Contest Branch page, the ARRL Contest Update and the WA7BNM Contest Calendar for more info. Looking for a Special Event station? Be sure to check out the ARRL Special Event Station Web page. The winner of the QST Cover Plaque Award for December is Robert H. Welsh, N3RW, for his article "How the Ionosphere Was Discovered." Congratulations, Robert! The winner of the QST Cover Plaque award -- given to the author or authors of the best article in each issue -- is determined by a vote of ARRL members on the QST Cover Plaque Poll Web page. Cast a ballot for your favorite article in the January issue by Sunday, January 31. Knut Haugland and Torstein Raaby were the the two radio operators on board the Kon-Tiki. Both Haugland and Raaby were active in the Norwegian Resistance during WW II. Knut Magne Haugland of Norway passed away on December 25. He was 92. Haugland was one of five men, who with Thor Heyerdahl in 1947, successfully crossed the Pacific Ocean in a 45 foot raft made of balsa wood and bamboo -- named Kon-Tiki -- to prove that people from South America could have settled Polynesia in pre-Columbian times. Heyerdahl and his companions sailed the raft for 101 days more than 4300 miles across the Pacific Ocean before smashing into a reef in the Tuamotu Islands on August 7, 1947. The expedition used call sign LI2B and carried three watertight radio transmitters. The first operated on the 40 and 20 meters, the second on 10 meters and the third on 6 meters. Each unit was made up entirely of 2E30 vacuum tubes providing 10 W of RF input. As an emergency backup, they also carried a German Mark V transceiver originally re-created by Britain's Special Operations Executive in 1942. Other equipment included a hand-cranked emergency set of the Gibson Girl type for use on the maritime bands, a special VHF set for contacting aircraft and two British Mark II transmitters. 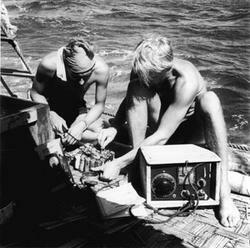 The Kon-Tiki also carried a National Radio Company NC-173 receiver. Dry batteries and a hand-cranked generator supplied the power. Read more here. Registration remains open through Sunday, January 24, 2010, for these online course sessions beginning on Friday, February 10, 2010: Amateur Radio Emergency Communications Level 1; Antenna Modeling; Radio Frequency Interference; Antenna Design and Construction; Ham Radio (Technician) License Course; Propagation; Analog Electronics, and Digital Electronics. To learn more, visit the CEP Course Listing page or contact the Continuing Education Program Coordinator.